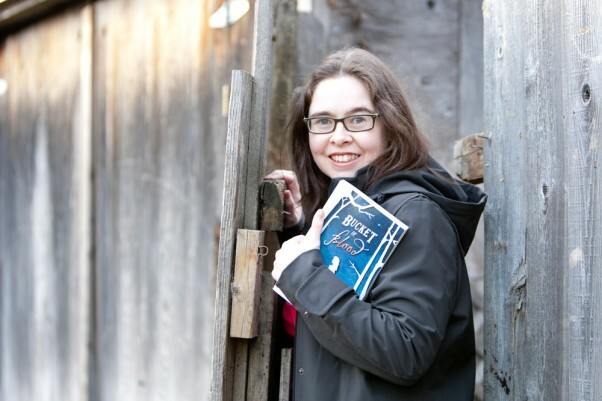 Local writer finds inspiration for her new novel in the late 19th century coal mining town of Cumberland. In Cumberland’s newest shop there is always a pot of tea brewing. Today the tea is Thought Flow, made from a variety of ingredients such as lemon verbena, ginko, holy basil, rooibos and rosemary. “It’s called Thought Flow because it helps increase circulation to the brain,” explains the proprietor, Yarrow Willard, as he pours me some tea into a small Asian bowl. I sip the hot, delicious tea and peruse the wood and glass shelves filled with product— some familiar to me, some not. The store, called Harmonic Arts, is something of a botanical boutique. The smallish space, though well stocked with an eclectic variety of simple yet effective natural remedies, doesn’t seem crowded. Instead the products are displayed in a manner that exudes calm intent. The popular tea blends with names like Immune Boost, Relaxing Blend and Digestive Power are arranged with their beautiful green labels in visible rows. There is a wall filled with an intriguing collection of tinctures and salves. In a separate corner is a space devoted to delicious edibles such as dried fruits and nuts, honey and spices. I even spy a package that contains all the separate ingredients one needs to make homemade chocolate. As I stroll through the shop, talking with Willard and sipping my tea, I realize Harmonic Arts is not your ordinary store—but then again, Willard isn’t your ordinary guy. Willard’s life has never been run-of-the-mill. In fact, his early years could even be described as extraordinary. When asked about his childhood he recalls being surrounded by books and plants. That’s because both of his parents were trained as master herbalists. In fact, his father is the famous Dr. Terry Willard, creator of the Wild Rose Herbal Detox and the Wild Rose College of Natural Healing. Considering his parents, it really is no surprise that Willard is doing what he’s doing—it’s literally in his blood. Willard also recalls unique childhood experiences such as sleeping in teepees and attending sweat lodges with the local First Nation Tribes. His father spent a lot of time with and focused much of his learning on the First Nations people, especially their long standing use of local plants and herbs for medicinal purposes. Dr. Willard tapped into this knowledge because he believed what has the most strength and validity is often what has been used for thousands of years. Willard’s surroundings while growing up were also unique in that he was practically raised at a college. Dr. Willard started the Wild Rose College of Natural Healing in Alberta right around the time Willard was born. As a young boy, he would spend a significant amount of time at the college. He’d even listen to his father’s lectures, some of which were conducted outside. Specifically, Willard recalls learning about the local herbs found around the college during herb-walks, where his father would teach the students about the local plants and their uses. During these herb-walks, his father would often ask young Willard to tell the students about the plant for which he is named—yarrow. It’s hard not to smile when you imagine him as a young boy explaining to the students gathered around him that the Latin name for yarrow is Achillea millefolium, named after Achilles who asked the gods to send down a plant to protect his soldiers from sickness and pain. Eventually, Willard attended the Wild Rose College as an official student and became a master herbalist like his parents. During his studies he became particularly interested in the medicinal uses of mushrooms and seaweed. He also met his future wife, Angela, who was studying at the college alongside him. After their marriage they decided to move to Vancouver Island where they could learn more about the abundance of plants found here. The couple found Vancouver Island a wonderful place to study and develop their knowledge. The temperate weather we enjoy on the Island, though sometimes annoyingly wet, is excellent for growing medicinal plants. We are literally surrounded by what we could call a green pharmacy. For example, we all know how well weeds grow here on the Island, but plants considered weeds by most are actually valuable to those in the know. Dandelions, nettles, and comfrey are quick growing plants that oftentimes we pull from the ground while spewing expletives. But people like the Willards value these plants for their medicinal qualities—nettle for its anti-inflammatory and anti-allergy properties; dandelion for its liver cleansing properties; and comfrey for its ability to support wound healing. Willard finds it interesting that what’s typically our best medicine grows so readily and so close to us. “It’s like the plants want us to heal,” he says. In addition to our mushroom-filled forests, British Columbia is blessed with a plethora of beaches laden with seaweed— or sea vegetables, as Willard prefers to call them. Sea vegetables are high in minerals and electrolytes so they’re a delicious and effective way to increase the nutritive value of our meals. To ensure the quality of the sea vegetables available through Harmonic Arts, Willard only buys from harvesters located on the Queen Charlotte Islands, as the Northern beaches are cleaner than the beaches located close to large populations. He also offers a few varieties of sea vegetables that are farmed and therefore organic and free of any heavy metal toxicity. In addition to the very popular Sea Vegetable Blend, which can be sprinkled on rice or in soups, Harmonic Arts also carries popular varieties such as Kombu, Dulse, Nori, Sea Lettuce and Bull Kelp. If you’re unsure of how to incorporate sea vegetables into your meals, they can suggest plenty of recipe ideas. 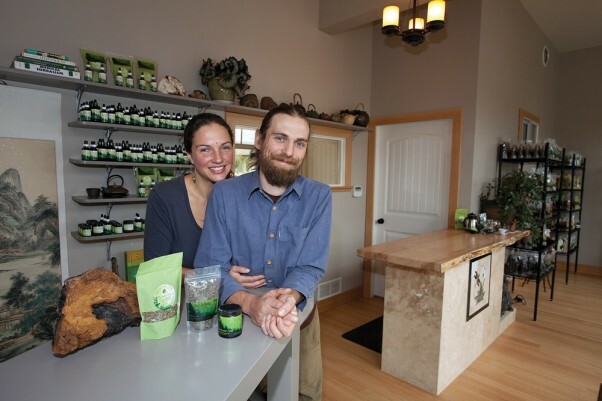 The huge variety of medicinal plants found not only on Vancouver Island but throughout the world, coupled with Willards’ belief that we need easy access to these plants, led him and his wife to create their store. Initially they packaged about 100 products only available through health-food stores and online. However, it didn’t take long before they realized there was a huge demand for what they could offer. Now, after three years, Harmonic Arts has more than 1,000 products and more than 300 individual herbs all available for sale directly from the store. In addition, many of these products are still sold through health food stores—some local and some as far away as Ontario. Though he produces and packages a large amount of goods, Willard works hard to ensure each item he offers is top quality. With concentrated products such as medicinal plants and herbs, quality is incredibly important—since poor quality often equals poor results. Willard believes that the quality of a product starts where and how it is grown, and then how it’s harvested, processed and packaged. If he cannot grow and harvest the product himself, he uses strict measures to ensure what he chooses to sell is the finest available. For example, he researches everything he can regarding the growth of the plant, from how it is planted to the treatment of those who harvest it. In addition, he has a competent staff and a specially designed facility to ensure that once he receives a product, it is prepared, packaged, and stored in the best possible way. Though Willard believes that our modern lifestyle is largely one of disempowerment, he also believes that more and more we are becoming aware of what we’ve lost over the years, and we are beginning to empower ourselves—and heal ourselves—once again. He also feels that although the overstimulation of today’s society has caused us to dumb down our senses, it’s possible to retune our minds to hear what our bodies are trying to tell us. For example, we might initially want to heal a patch of eczema simply because we don’t like how it looks. We can use a cream prescribed by a medical doctor that will make the rash disappear, but the initial cause of the rash is still with us. Alternatively, if we pay close attention and listen to our body, oftentimes we can find the true cause of our ailment—such as imbalances caused by stress or an unhealthy lifestyle. Willard believes that empowerment also comes from learning. To facilitate learning, Harmonic Arts sells a number of books on a variety of topics, such as wildcrafting, plant identification and herbal body care. As well, he says the internet is a fabulous place to begin to teach oneself about medicinal herbs and plants. Unfortunately, it’s easy to get confused by the conflicting information that abounds on the internet. To combat confusion, Willard suggests a way to ensure the treatment you want to try is right for you—when choosing a medicinal herb, one should look for three sources to confirm the treatment as valid: one source from the internet, one from a book, and one from experience. If still in doubt, it’s always possible to ask a staff member at the shop. In fact, there’s a clinical herbalist at the store most days. After perusing Willard’s shop and talking with him I feel motivated and excited to learn more about the healing art of medicinal plants. I feel fortunate to have such a wonderful store nearby where I can access the amazing variety of useful and unique products. As I walk out the door, I leave with a belly full of tea, my hands full of goodies, and my mind full of positive expectations. if you will, the choreography—not to mention the energy—demanded on a daily basis from a woman in her 30s who is married with two pre-school age children (Zoe, six, and Linus, just under two), who works full-time in the North Island College marketing department, and who also manages to set aside two hours each and every day to write. Find out more about Bannerman at www.foxandbee.com. Her novel, Bucket of Blood, is available locally at the Laughing Oyster Bookstore, the Cumberland Museum, the Courtenay Museum, Blue Heron Books and Abraxas Books and Gifts on Denman Island.